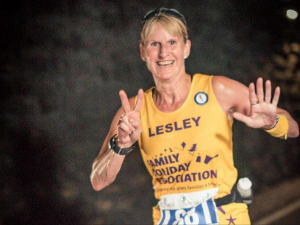 Lesley Colman is taking on 12 half marathons in 12 months for the Family Holiday Association! At three-quarters of the way through the challenge, you can read her update below. 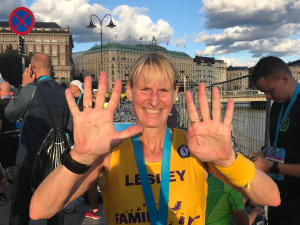 You can also read part one here, and find out more about Lesley’s challenge here. “So here we are, one day away from race number 10 of 12. I’m not sure where the time has gone. Oh yes, I know… I have been running! 😊 And races five to nine have been a mixed bag but primarily hot, hot, hot! 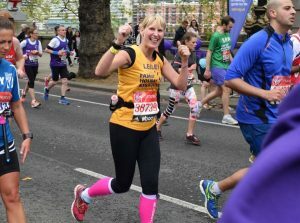 “No-one said this challenge was going to be easy, but with no reprieve from one race to the next my body is now starting to let me know it needs another rest. So thankfully there are six weeks between the races in October and November so I am going to be kind and thank my body for getting me this far… next stop nearest spa! 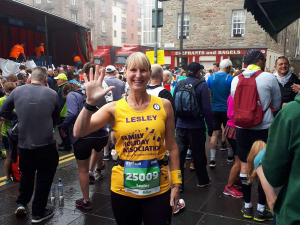 “Some of the final words I uttered in the last blog were about race number five in Edinburgh ‘The organisers boast the route is the ‘fastest and flattest half marathon in the world’ – will let you know if that holds true in the next blog!’…well it certainly was – I got a Personal Best! I only had a 10-minute walk to the start and it was really well organised, with different pens being asked to congregate in different areas around the start – each had dedicated toilets and a baggage lorry. Conditions were perfect – early start, scotch mist, minimal wind, not too cold, great support and a fabulous route (loved it so much signed up straightaway for 2019!). 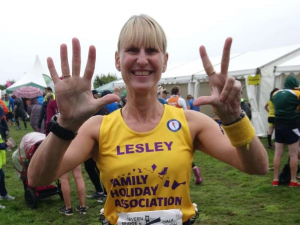 “June saw me running race number 6 in my home town Swansea – but it wasn’t without its dramas! A late decision to drive down Friday evening to avoid the inevitable motorway traffic (heading to the Ed Sheeran concert in Cardiff and The Killers concert in Swansea) meant I packed quickly. And realised at 0600 on race day that I forgot my race number! So, my usual calm and organised prep time lost, coupled with not feeling 100% all week and having to run in 22 degrees, I knew I was not in for a good race. So no surprise then when I started to feel weary at 9 miles and then collapsed at the end – I can’t even remember running the last 2 miles! I was taken by wheelchair to the medical centre who said I’d suffered from heat exhaustion. However, thanks to one of my running buddies Paul, who made sure I crossed the line (‘finishing lines not finishing times’), I still finished in a respectable 1:58:10 – which is exactly my time in Lanzarote in Dec 2017, so indicative of my running capability in heat. On a lighter note, I achieved a fundraising goal in June and reached my £1,200 target on my Virgin Money Giving page! From my work Dress Down Days and cake sales in the GWR Head Office, to my team’s World Cup Sweepstake and general sponsorship donations, my total fundraising to date is £2,424 – with the Gift Aid still to be added!  “The July race in Bath was only two weeks later, running through two of the old railway tunnels (reopened by Sustrans). I knew that it was going to be one that I could not race as the tunnels are narrow, there are runners heading in both directions, and you’re sharing it with walkers (with prams and wheelchairs) and cyclists. With the extreme heat (28 degrees at the start of the race) outside of the tunnels, and cold air inside, your muscles are continually adapting and coping with temperature fluctuations. 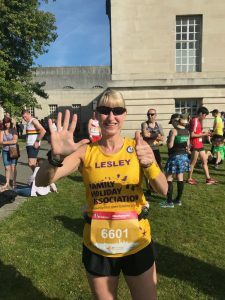 The temperature was rising throughout the race, and being so soon after the way I felt in Swansea, I was a bit tentative but still ran at a comfortable pace thanks to another of my running buddies Lynda. My finishing time was 2:03:35! “So now I was really ready for a rest. And thankfully I had seven weeks between Bath and my August race, running a route that takes you over the old Severn Bridge at the beginning and the end. So off to Crete I went for my holiday – and more extreme heat! The wind calmed when we were running down the country lanes, though the hills are still as unforgiving as they’ve been in previous years – and the air was blue on occasion! Thanks to Paul again for pacing me and not running away from me to get dry quicker! My time was 1:55:18 and a course Personal Best. “Sat 15th September at 15:30 saw my brother and I on the start line at Stockholm half marathon. Finally, I got to a city I have wanted to go to all my life – I was so excited! I was quite looking forward to a flat course in 12 degrees and showers – when in fact Stockholm turned out to be undulating (too many ups and downs for my liking! ), 18 degrees and bright sunshine! Sooooo…. The next blog will be the final one! By December I will have completed all twelve races, the challenge will be achieved, and most importantly, I will have raised an incredible amount for the Family Holiday Association. The year isn’t over yet though – three more races to go in Salisbury, Windsor & Eton (Dorney Lake) and the grand finale in Lanzarote – and still time for you to show your support for both the charity and myself, by sponsoring me on my fundraising page here.